The underscored portion says it all. WordPress, Wikipedia, CraigsList, and about a dozen other Web sites are going dark on Wednesday in protest of antipiracy legislation. Low mortgage rates sent mortgage applications soaring last week, with requests for home purchase loans jumping 10 percent alone. How bathrooms, square footage, and bedrooms are counted can vary widely among MLSs. As such, one group is trying to standardize the way homes are described on the MLS. A South Florida radio and TV host who shared with listeners how to make it big during South Florida's real estate boom was sentenced to four years in prison for bilking money from his real estate clients. A Lincoln, Neb., home inspector has filed a defamation lawsuit against a real estate agent and her company, alleging that the agent referred to him as a "total idiot" in an e-mail sent to about 400 other agents. When it comes to selling stigmatized homes, experts recommend doing whatever it takes to give people peace of mind. The economic data last week was mostly disappointing. Retail sales for December were weak, the November trade deficit was larger than expected, and initial weekly unemployment claims increased sharply. 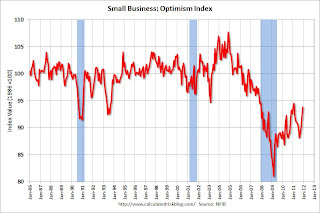 The good news was consumer sentiment and small business confidence increased. This data suggests the US economy grew in Q4, but at a slightly slower pace than previously expected. As an example, Goldman Sachs lowered their Q4 GDP estimate to 3.2%, and Merrill Lynch lowered their Q4 estimate to 3.0% from 3.3%. On a monthly basis, retail sales were up 0.1% from November to December (seasonally adjusted, after revisions), and sales were up 6.5% from December 2010. Sales for November were revised up from a 0.2% increase to 0.4%. 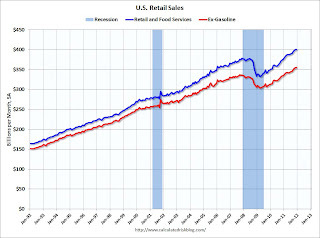 Retail sales excluding autos decreased 0.2% in December. This was well below the consensus forecast for retail sales of a 0.4% increase in December, and a 0.4% increase ex-auto. [T]otal November exports of $177.8 billion and imports of $225.6 billion resulted in a goods and services deficit of $47.8 billion, up from $43.3 billion in October, revised. November exports were $1.5 billion less than October exports of $179.4 billion. November imports were $2.9 billion more than October imports of $222.6 billion. 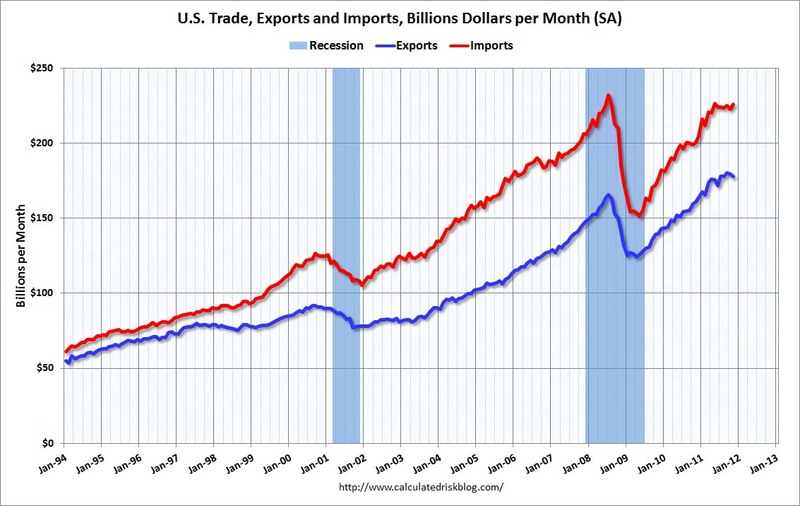 This graph shows the monthly U.S. exports and imports in dollars through November 2011. Exports decreased and imports increased in November. Imports had been mostly moving sideways for the past six months (seasonally adjusted). Exports are well above the pre-recession peak and up 10% compared to November 2010; imports are up about 13% compared to November 2010. The trade deficit was above the consensus forecast of $45.0 billion. In the week ending January 7, the advance figure for seasonally adjusted initial claims was 399,000, an increase of 24,000 from the previous week's revised figure of 375,000. The 4-week moving average was 381,750, an increase of 7,750 from the previous week's revised average of 374,000. The dashed line on the graph is the current 4-week average. 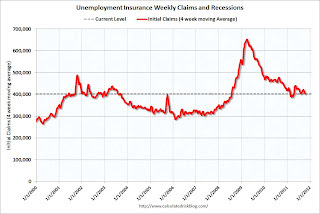 The four-week average of weekly unemployment claims increased this week to 381,750. The 4-week moving average is still well below 400,000. 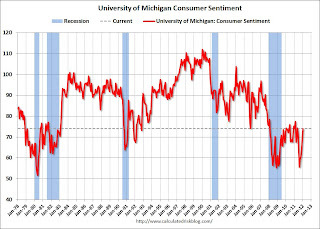 The preliminary January Reuters / University of Michigan consumer sentiment index increased to 74.0, up from the December reading of 69.9. Most of the recent sharp decline was event due to the debt ceiling debate, and sentiment has rebounded as expected. 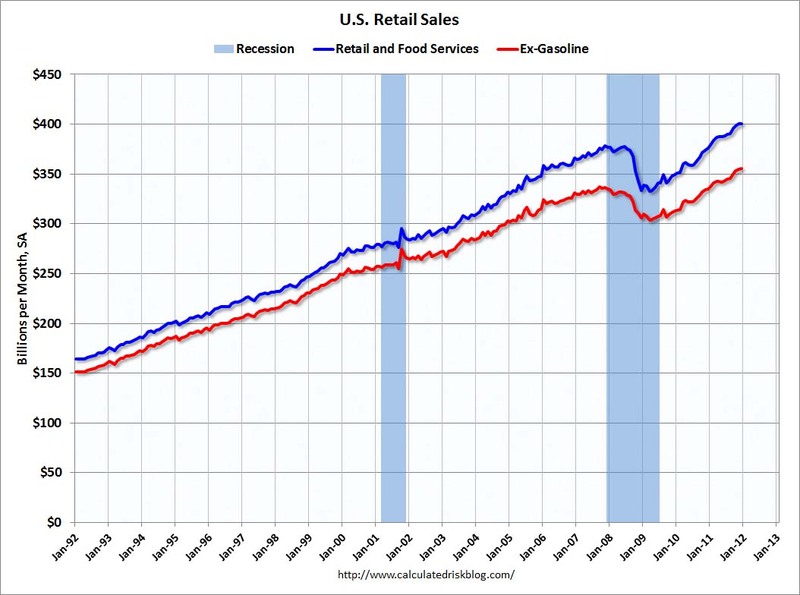 Now it is all about jobs, wages - and gasoline prices. Sentiment is still fairly weak, although above the consensus forecast of 71.5. Jobs openings declined slightly in November, but the number of job openings (yellow) has generally been trending up, and are up about 7% year-over-year compared to November 2010. Quits increased in November, and have mostly been trending up - and quits are now up about 12% year-over-year. 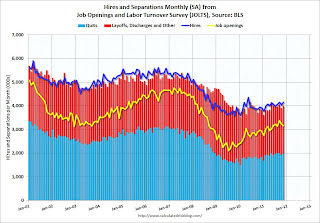 These are voluntary separations and more quits might indicate some improvement in the labor market. (see light blue columns at bottom of graph for trend for "quits"). The index was down 1.4% in November, and is down 4.3% over the last year. 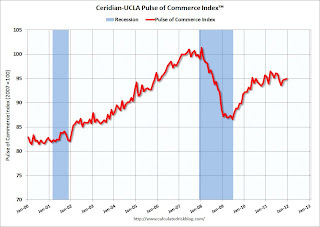 The index is off 32.8% from the peak - and up just 1.2% from the March 2011 low. Some of this decrease is seasonal (the CoreLogic index is NSA). 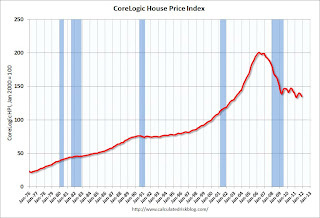 Month-to-month prices changes will probably remain negative through March 2012 and it is likely that there will be new post-bubble low for this index in the next month or two. 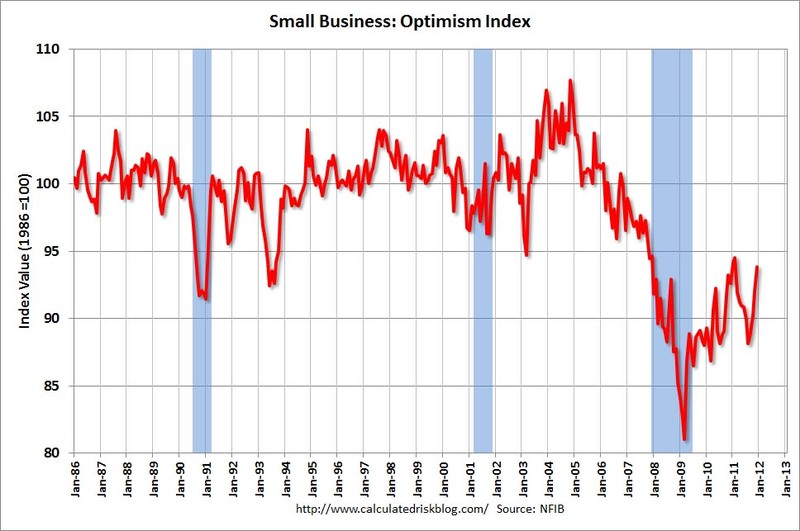 This graph shows the small business optimism index since 1986. The index increased to 93.8 in December from 92.0 in November. This is the fourth increase in a row after declining for six consecutive months. Retail landlords also have been helped by a virtual shutdown in new store construction, meaning they face less competition for tenants. Only 4.5 million square feet of shopping-center space opened in 2010, the lowest figure in 31 years, according to Reis. Last year was slightly higher, with only 4.9 million square feet being delivered. 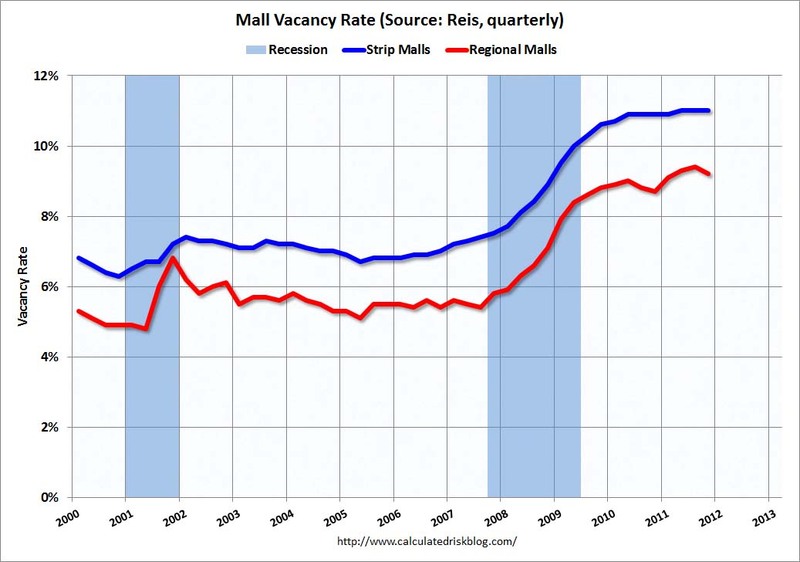 The vacancy rate for regional malls is just below the record set last quarter, and the vacancy rate for strip malls is just below the record set in 1990. 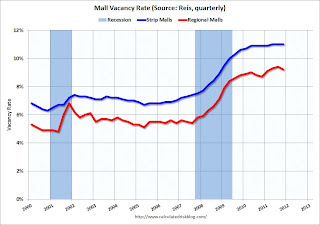 It is still very ugly for malls ... but the good news is new construction is at very low levels. A total of 48,186 single-family homes and condos were sold in Las Vegas last year, topping the previous record of 46,879 set in 2009, the Greater Las Vegas Association of Realtors reported ... Roughly half of all sales were cash-only transactions, while 46.8 percent were real estate-owned, or bank-owned properties returning to the market after foreclosure. Another 26.6 percent were short sales, or lender-approved sales for less than the principal mortgage balance. ... new-home sales plummeted from nearly 39,000 in 2006 to fewer than 4,000 in 2011, the lowest level since Home Builders Research began tracking the market in 1988. This graph shows the sales per year. The are more sales now than during the peak of the bubble! However new home sales are at record lows because of all the vacant housing units and distressed sales. 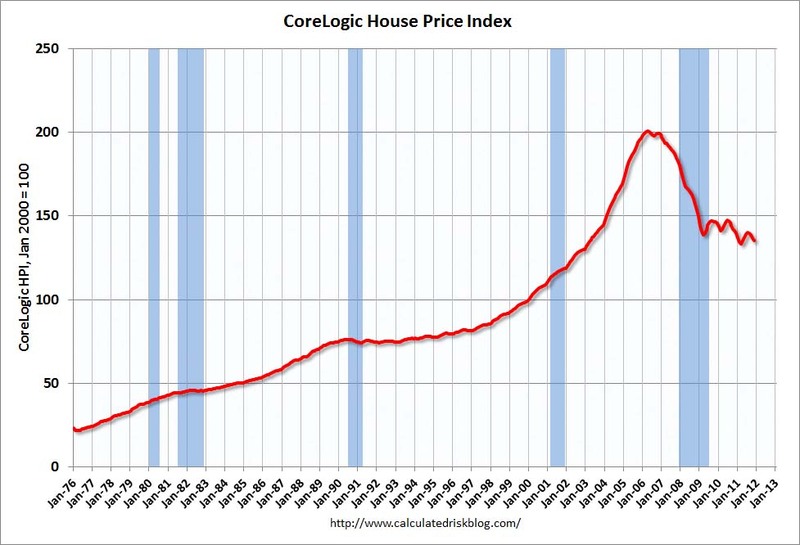 Also - as the article mentions - prices are still falling. 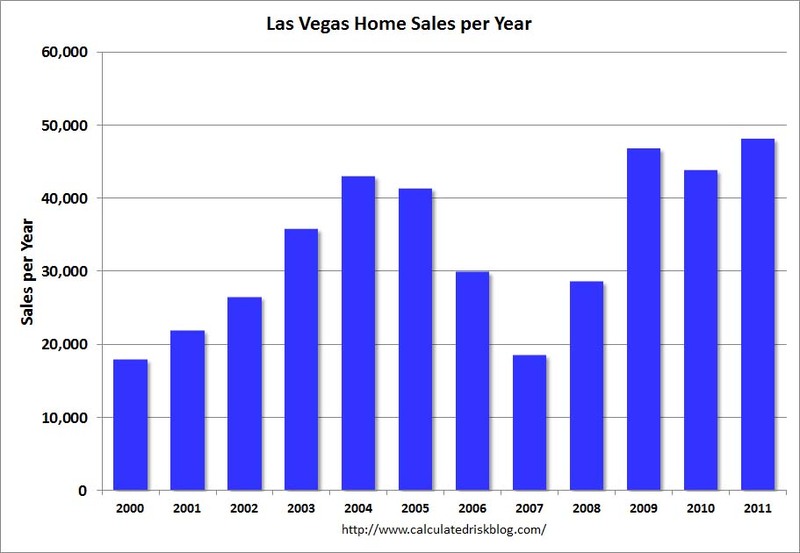 According to Case-Shiller, prices in Las Vegas have fallen about 14% since June 2009, so those people who bought in 2009 have lost money (although many paid cash, so they don't have "negative equity"). About a dozen state attorneys general met this week to discuss their mortgage investigations and how they might work together as settlement talks with banks over foreclosures drag on, three people familiar with the matter said. Over the weekend, the Justice Department contacted four smaller mortgage servicers, including U.S. Bancorp, PNC Financial Services Group Inc. and HSBC Finance Corp., with the goal of including them in any future settlement agreement. The overture was a first step meant to get reaction from the smaller banks. More on the meeting from the Financial Times: State prosecutors confer over US mortgages probes. It doesn't sound like a deal is close. As was widely rumored, Standard & Poor's lowered its long-term sovereign credit rating on France to AA+ and Spain to A.
Greece’s creditor banks broke off talks after failing to agree with the government about how much money investors will lose by swapping their bonds, increasing the risk of the euro-area’s first sovereign default. Proposals by a committee representing financial firms haven’t produced a “constructive consolidated response by all parties,” the Washington-based Institute of International Finance said in a statement today. Talks with Greece and the official sector are “paused for reflection on the benefits of a voluntary approach,” the group said. Jan 20th: The "troika" discussions with Greece are set to conclude. Jan 24th: EU finance ministers meet in Brussels. Jan 30th: European Union leaders meet in Brussels on crisis. Meanwhile the Italian 10 year yield is up to 6.64%, and the Spanish 10 year yield is up to 5.22%. 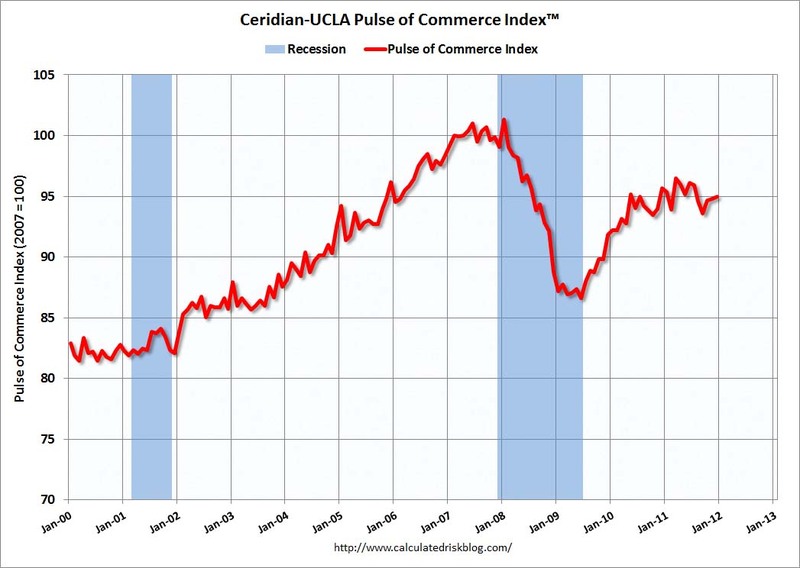 The Ceridian-UCLA Pulse of Commerce Index® (PCI®), issued today by the UCLA Anderson School of Management and Ceridian Corporation, rose 0.2 percent in December following the 0.1 percent increase in November and the 1.1 percent increase in October. Although December’s news is positive, the combined effect of the three consecutive positive months was not enough to offset the weakness of trucking last summer and the PCI in December 2011 is 1.2 percent below its June 2011 level. Based on the latest PCI data, the forecast for December Industrial Production is a 0.29 percent increase when the government estimate is released on January 18. This graph shows the index since January 2000. This index declined sharply in late summer and has only partially rebounded over the last three months. Mostly this index moved sideways in 2011 (down 0.7% from December 2010). Note: This index does appear to track Industrial Production over time (with plenty of noise). It's a distinction that doesn't portray the mortgage business in a very good light. But it's a milestone nonetheless: The national Loan Modification Scam Database has now collected more than 20,000 complaints. The Department of Housing and Urban Development has suspended James Grier, the president of Section 8 apartment complex Mantua Gardens East in Philadelphia, Pa. from conducting business with the federal government. Advocates for Consumer Affairs, a compliance and risk management firm that audits mortgage loans nationwide, said it plans to concentrate their efforts to make sure homeowners receive loans that are enforceable from financial institutions. On Dec. 22, 2011, the 9th Circuit Court of Appeals upheld the sentences of Terrance "Terry" and Sonya "Cheri" Tucker, a Thousand Oaks couple who pleaded guilty to bank fraud in a real estate scheme that cheated homebuyers and investors. The New York Court of Appeals late Thursday agreed to allow the National Association of Federal Credit Unions to argue that the state's federally chartered CUs should be exempt from the state's mortgage recordation tax. President Obama's recess appointment of Richard Cordray on Wednesday will clear the way for the Consumer Financial Protection Bureau to use its full enforcement and regulatory powers to police all mortgage lenders and servicers. prediction of claim propensities, over and above the information contained in AVMs." purchase, produced by both an appraisal and by an Automated Valuation Model (AVM). Logistic regression is used to estimate the quarterly hazard of a serious delinquency, or. . .
in this paper.. . .
quickly, or, for that matter, fraud. constitutes an estimate of the market value. Such an estimate may be biased or unbiased. the inherent noise in any estimation process. sort considered here. See US GAO (2004) for a discussion of FHA's role in monitoring appraisers. than the variances of appraisals. noise in the AVM estimation process. and test the coefficients on the Appraisal and AVM Estimate values. overpriced properties, or by triggering renegotiated prices. evaluations of portfolios of mortgages. and with the GAOrisk specification slightly outperforming the TOTAL scorecard specification. predictor of loss given default, an important but often ignored dimension of credit risk. IT'S THE LAW-Designation Discrimination is Illegal [FIRREA, Sec. 564.6]: Professional Association Membership http://www.orea.ca.gov/html/fed_regs.shtml#Statement7 Membership in an appraisal organization: A State Certified General Appraiser may not be excluded from consideration for an assignment for a federally related transaction by virtue of membership or lack of membership in any particular appraisal organization, including the appraisal institute. HUD's Real Estate Assessment Center conducts physical property inspections of properties that are owned, insured or subsidized by HUD, including public housing and multifamily assisted housing. About 20,000 such inspections are conducted each year to ensure that assisted families have housing that is decent, safe, sanitary and in good repair. This page provides a full historical view of the results of those inspections, providing point-in-time property scores. Results are available for download as a comma-delimited dataset. Separate datasets are available for public housing and for multifamily assisted properties. The results represent the inspections conducted from 2001 through September 2009. The dataset includes property identifiers and location information. Detailed descriptions of the inspection processes can be found in Federal Register notices 66 FR 59084 for public housing and 65 FR77230 for Office of Housing programs. 3) plan for future affordable housing needs. Directions: Please first select your state and then slect the closest metropolitan area(s) you work in for each question. Rural areas are included for each state. NOTE: This survey is for non AMC work. Fee quotes include the 1004MC form, as required by law. If you don’t provide a particular appraisal product, please leave that question blank. Once you've completed the survey, please send the survey link to as many appraisers as possible and ask him/her to complete it. The value of this survey depends on participation. Please allow a few moments for the page to load. Which state do you work in? (Please come back to complete the survey again if you work in multiple states.) Please allow a few moments for the page to load. One issue every other week is delivered via email to keep you up to date with industry news as it happens. It's free, you can opt-out at anytime and your information will always remain private. To opt-in, and to be notified when the results of this survey are posted, please email subscription@workingre.com with "Appraiser Newsletter" in the subject. First Security Investment, Inc. cordially invites you to our Annual Holiday Champagne Brunch. First Security Investment Co. Inc. Admission: $15 at the door or bring a toy valued at $15 or more. Please R.S.V.P. by December 7, 2011 to First Security Investment Company, Inc. at (323)299-7900. In the two weeks leading up to Thanksgiving Day, the FDIC sued 29 individual residential appraisers and a rafter of mortgage brokers in 12 separate lawsuits. All of the appraisers sued in this round reside in California -- in the last three years, the FDIC has so far sued a total of approximately 140 appraisers and appraisal firms in AZ, CA, GA, IL, MD, MI, MN, NV, SC, and UT. In addition, the FDIC has identified approximately 350 additional appraisers as having delivered negligent appraisals to the two AMCs it has sued. The FDIC's complaints against the 29 most recent defendant appraisers uniformly allege that the appraisers were professionally negligent by overappraising the value of properties securing loans by failed Downey Savings in 2004-2007. The average claim against each appraiser is $314,674, which is the amount claimed as damages by the FDIC for unpaid principal, interest, late charges, foreclosure costs and other fees on each nonperforming loan. The complaints concern both origination and review appraisals and include both supervising and trainee appraisers as defendants. One of the recently sued appraisers has now been sued twice by the FDIC. This is the third appraiser to be sued twice by the FDIC within the last year. Another of the defendant appraisers was previously identified by the FDIC as having provided allegedly faulty appraisals for WaMu through the AMCs sued by the FDIC in separate lawsuits. Issues like these are starting to cause liability issues for AMCs in connection with current appraisal work because a few lenders have indicated they expect AMCs to identify appraisers accused of such negligence. By Jason Shueh // Construction on the major affordable housing project in Kings Beach likely won't be finished until fall 2012, officials said this week, rather than an initial deadline of next spring. Meea Kang, of Domus Development, lead developer for the 77-unit, $33 million project — part of the Kings Beach Affordable Housing Now campaign launched in 2010 — said last year's 600-plus inches of lake-level snowfall delayed construction to the four sites located on Fox, Trout, Deer and Chipmunk streets. By David Baker // A Massachusetts company whose prefab homes fold up like origami will open a factory today on Vallejo's Mare Island. For Bill Haney, president of Blu Homes, it seems an ideal fit. By Bill Koeneker // The Malibu City Council this week discussed the completed draft of the Housing Element update at its meeting Monday night when more options were made available for review. The council, on a 4-1 vote with Councilmember Pamela Conley Ulich dissenting, agreed to authorize the staff to submit the draft 2008-2014 Housing Element to the state of California Department of Housing and Community Development or HCD, for review and comment. … John Douglas, the consultant hired by the city to draft the document, told the council the plan currently takes a two-prong strategy in meeting affordable housing needs. SIGN ON SAN DIEGO: By the numbers: 'Underwater' homes in Calif.
By Lily Leung // California ranked sixth in the nation in negative equity, widely known as being "underwater" on your mortgage, based on the latest data from real estate tracker CoreLogic this week. The third quarter was the first time the state has not been in the Top 5 since 2009, when the company started to track negative equity, a state in which a homeowner owes more on their mortgage than their home is worth. By Jeff Collins // Georgia has pushed California out of the "top five" among the nation's most "underwater" states. According to figures released recently by Santa Ana data firm CoreLogic, 30% of Georgia's homes have mortgages that are greater than the property's value during the third quarter, vs. 29.7% in California. Until now, California had been in the top five since CoreLogic began tracking underwater (or "negative equity") rates in 2009. Enterprise Community Partners and the Low Income Investment Fund (LIIF) announced a partnership to advance transit-oriented development (TOD). The entities intend to work with other national and local partners to promote regional equity collaboratives that encourage discussion and planning for TOD projects; assess community financing needs and develop appropriate solutions; share knowledge and best practices to benefit the broader community development field; and develop and advocate for public policy that promotes equitable TOD. By Jason Lange // (Reuters) - Factories shrugged off weakness in the global economy during November as manufacturing activity rose to its highest level in five months, giving a fresh sign that the American economy could be accelerating. Also pointing to stronger growth, U.S. construction spending increased more than expected in October… Separately, the Commerce Department said construction spending rose 0.8 percent to an annual rate of $798.53 billion. By Gale Holland, Sam Quinones // For a clue to why California is losing its allure as a place to settle down, just ask Jennifer McCluer, who moved out of California in 2007 after she obtained her license in skin care. Unable to afford Orange County's sky-high rents, she opted for Portland, Ore. "A big motivator was that I lived with roommate after roommate after roommate," said McCluer, 30. "Friends said you could probably live on your own up here. The rent was a huge deal for me." SAN BERNARDINO and MURRIETA, Calif., Dec. 1, 2011 / PRNewswire / The Housing Authority of the County of San Bernardino (HACSB), the largest provider of affordable housing in the County, and HelioPower, an integrated energy solutions company with over 2000 solar and clean energy systems engineered and installed since 2001, today announced the completion of the largest Multifamily Affordable Solar Housing (MASH) Track 2 grant project in California. A groundbreaking ceremony was held in downtown Pismo Beach recently to celebrate the city’s first low-income housing project. The Pismo Creek Bungalows project at 360 Park Ave. will feature a 14-unit rental complex, laundry facilities, onsite parking and a common area for tenants. The project is a partnership between Pismo Beach and People’s Self-Help Housing … The property was purchased with money from the city’s inclusionary housing fund, which developers can pay into rather than building affordable units within their projects. By Melissa Flores [11/16/11] // The San Benito County Board of Supervisors received a presentation Tuesday on a 10-year plan to end homelessness in the San Benito and Monterey county area - the outcome of 14 months of planning and meeting between stakeholder agencies in the region. One of the key reasons to devise the 45-page plan is so that it better positions San Benito County to apply for federal or state grant funding. By Stephanie O’Neill // The July death of a schizophrenic homeless man after an altercation with Fullerton Police has focused attention on care for the mentally ill. Orange County supervisors might now adopt “Laura’s Law” so clinic workers can go into the streets to treat the mentally ill. Laura’s Law is in effect only in Nevada County, east of Sacramento. Officials there say it’s humane and cost-effective … The result? Laura’s Law, which allows counties, if they choose, to require medical treatment for a unique segment of the mentally ill community. By Lynnea Lombardo // The Inland Empire was one of the first areas to see the effects of the Great Recession and remains one of the last places to see improvement. However, a new economic report indicates some positive signs for the High Desert. 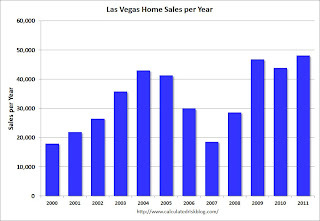 … The High Desert had the greatest increase in existing home sales, up 11 percent between September 2010 and this year. And while new homes sales declined an average of 19 percent in the Inland Empire, the Victor Valley only saw a 4.3 percent decline with 112 new homes sold. Underwater mortgages remain a problem. [11/18/11] // The Bureau of Land Management has given its blessing to the DesertXpress Victorville-to-Las Vegas passenger rail project. The decision authorizes a right-of-way grant to DesertXpress Enterprises LLC to construct and operate a high-speed passenger rail line on public lands between the High Desert city and the gambling mecca. … The Federal Railroad Administration estimates that the project would create more than 45,000 construction-related and 722 permanent operational jobs. About 821 acres of public land are needed for the permanent right-of-way, officials said. SACRAMENTO BEE: Is there new life for CADA's R Street warehouse project? By Tony Bizjak // It was to be Sacramento's first "lofts living" project, bringing a touch of New York lifestyle to an industrial area a few blocks south of the state Capitol. Instead, the Capitol Lofts project at 11th and R streets has become a 13-year headache for its sponsor, the Capitol Area Development Authority [CADA] and its development partners, who have been unable to get it financed. … CADA is a joint city-state agency that promotes housing and retail south of the Capitol, similar to a redevelopment agency. By Jason DeParle, Robert Gebeloff & Sabrina Tavernise // WASHINGTON — They drive cars, but seldom new ones. They earn paychecks, but not big ones. Many own homes. Most pay taxes. Half are married, and nearly half live in the suburbs. None are poor, but many describe themselves as barely scraping by. … The Census Bureau, which published the poverty data two weeks ago, produced the analysis of those with somewhat higher income at the request of The New York Times. The size of the near-poor population took even the bureau’s number crunchers by surprise. SACRAMENTO BEE: What will climate change mean for California? By Matt Weiser [11/20/11] // The songbirds at the feeder outside your window are not the same as they used to be. The goldfinch, the grosbeak and even the ever-present sparrow are all a little bit bigger. The reason is climate change, according to a new study, which found that 70 bird species, all common to Central California, have evolved a longer wingspan and greater body mass over the past 40 years. … Cloern's study marks the first attempt to explain how climate change may affect habitat in an entire estuary, in this case the Sacramento-San Joaquin Delta. In consideration of an appraiser's fee, (name of appraiser) hereby agrees to evaluate the tangible property belonging to (person items belong to) located at (place where items are located). Signed at: on this day of 19__. This letter sets forth the terms of my engagement of your services as an appraiser for the (describe item[s] to be appraised). This appraisal is sought for the purpose of (reason for obtaining the appraisal). I agree to pay you $ __________ as a retainer, which sum shall be applied against and deducted from the total fee due of $ ____________ which total sum shall be paid on presentment of a certified appraisal report (or set forth the terms of payment as discussed and agreed to with the appraiser). In the event of an inadequate appraisal, you further agree not to disclaim any and all liability. You agree to indemnify me and hold me harmless from any and all damages I may incur as a result of your false or inadequate appraisal. If all of the above terms meet with your approval, please countersign both copies of this letter and return one to me. Thank you for your cooperation. [11/17/11] // Very low-income senior citizens and persons with disabilities will be getting affordable supportive housing thanks to a total of $749 million in housing assistance from taxpayers via the U.S. Department of Housing and Urban Development. The grants will help non-profit organizations produce accessible housing, offer rental assistance, and facilitate supportive services for the elderly and persons with disabilities. A group that provides affordable senior housing in Fresno and Clovis has been chosen to receive just under $10.6 million in federal grant money. By Karina Ioffee // PEP Housing has been awarded $13.8 million from the U.S. Department of Housing and Urban Development, a part of which will be used to build new senior housing off North McDowell Boulevard. [November 17, 2011] // Single-family housing starts rose 3.9 percent to a seasonally adjusted annual rate of 430,000 units in October, according to newly released data from the U.S. Commerce Department. This improvement was somewhat masked by an 8.3 percent decline in multifamily starts that kept the combined number for nationwide housing production virtually flat at 628,000 units in October. Meanwhile, single-family permits also posted a measurable gain of 5.1 percent to 434,000 units in the latest report, which is their fastest pace since December of 2010. [11/16/11] // La Jolla, CA -- The Bay Area housing market logged another month of lackluster activity in October as some of the recent signs of incremental market improvement began to fade. High-end sales dropped markedly, likely the result of changes to “conforming loan” limits, a real estate information service reported. A total of 6,444 new and resale houses and condos sold in the nine-county Bay Area last month. [11/16/11] // An estimated 34,087 new and resale houses and condos were sold statewide last month. That was down 3.7 percent from 35,404 in September, and up 4.3 percent from 32,669 for October 2010. California sales for the month of October have varied from a low of 25,832 in 2007 to a high of 70,152 in 2003, while the average is 43,528. …Distressed property sales – the combination of foreclosure resales and “short sales” – continued to make up more than half of California’s resale market. STOCKTON RECORD: Affordable homes seem to be around every corner in S.J. By Eric Grunder // Homes are more affordable in San Joaquin County than at any time in at least two decades. "Absolutely, 100 percent ... this is the best market we've ever seen for a buyer," said mortgage broker Don Burns of Residential Group in Stockton. The National Association of Home Builders/Wells Fargo Housing Opportunity Index shows that more than 84 percent of the homes on the market here in the third quarter were affordable to families making the area's median household income of $65,400. By George Avalos // The Bay Area will outpace California in job growth next year, according to a new University of the Pacific forecast. Still, the Bay Area is at least two years away from recapturing the jobs lost during the recession, stated a separate forecast by Beacon Economics. "The job market has definitely hit the bottom," said Jeffrey Michael, director of the Stockton-based Business Forecasting Center at UOP. By Alejandro Lazo // Home is where not only the heart is these days — but also the elderly parents, the boomerang kids and the aging-in-place boomer homeowners. To accommodate the new generations-stacked-upon-generations lifestyle spawned by one of the most severe economic downturns in decades, builder Lennar Corp. is focusing on houses with something few others on the block can boast about: another house. The U.S. Senate approved a package of legislation Thursday night that eliminates future funding for high-speed rail projects, including the California bullet train. The vote, coming after a similar vote in the House of Representatives, leaves the future of the ambitious state project to create a new rail system from Southern California to the Bay Area uncertain. By Yesenia Amaro // About 1.2 million of the nearly 4 million residents living in the San Joaquin Valley face extreme levels of environmental hazards and social vulnerability that can lead to poor health, according to a study released Monday. An additional 1.9 million people face elevated levels of the same risks, the study found. In Merced County, the only community with a "very high health vulnerability" was El Nido, while Merced and Livingston have a "high health vulnerability." What Happens to the Mortgage when Property is Transferred to Beneficiaries at Death? by Fein, Such, Kahn & Shepard, P.C. Can I File My Own Bankruptcy in Phoenix? Just Say No. by Smith Law Group, P.C. Going, Going, Gone . . . California’s Solar Incentives for Builders/Developers . . . Don’t Delay . . . Going, Going, Gone . . . California Solar Incentives for Builders/Developers . . . Don't Delay . . . Important Changes to Federal Bankruptcy Rules Effective December 1, 2011 by Patricia Antonelli, Esq. The U.S. Supreme Court will hear the appeal of a tax discrimination case against the City of Indianapolis in Armour, et al., v. Indianapolis, et al. This case grows out of sewer tax assessments on residents of the Northern Estates subdivision. When the City made plans for a new sanitary sewer project, it provided homeowners with the option of paying the taxes up-front or by way of an installment plan over a period of years. Owners of 31 parcels opted to pay the entire amount up-front, while the remaining subdivision owners chose to pay the sewer tax in installments. Subsequently, the City Council adopted a new plan to finance the sewer project that would impose a flat fee per dwelling to connect to the sewer system. In adopting the new plan, the City abandoned the existing tax assessment system and decided to forgive all assessment amounts that remained due from the homeowners. As a result, the owners of 142 parcels in the Northern Estates Subdivision no longer needed to pay any more installments of the assessments. The 31 owners who had paid the sewer assessments up-front requested that the City refund those assessments, and when the City refused, the homeowners brought suit. The Indiana Supreme Court ruled in favor of the City, holding that the City did not violate the Equal Protection Clause because forgiving only the outstanding assessment balances was rationally related to a legitimate governmental interest. The Indiana Court accepted the City's justifications for the new financing plan, including that (1) the original financing plan imposed financial hardships on middle- and low-income property owners who were in need of sanitary sewers due to failing septic systems and (2) the owners who had paid the sewer assessments up-front were financially better off so the two groups of owners (those who paid up-front and those who opted for the installment plan) were not on equal legal footing and did not need to be treated equally. This case should be of interest to municipalities in setting taxing and other assessment rates that might differ between classes of people or properties. By Gennady Sheyner // Despite protests from the community and concern from the City Council, Wells Fargo Bank is now finalizing its sale of more than 1,800 housing units in East Palo Alto to a single buyer with a nationwide portfolio. The firm Equity Residential announced Friday that it is preparing to take ownership of the Woodland Park housing portfolio that was previously owned by the Palo Alto-based company Page Mill Properties. … The company, according to the statement, plans to operate the apartment community "with a commitment to maintaining its status as affordable, workforce housing in a region with a lack of available alternatives in this category of housing." By Patricia Leigh Brown [11/12/11] // MERCED, Calif. — Heather Alarab, a junior at the University of California, Merced, and Jill Foster, a freshman, know that their sudden popularity has little to do with their sparkling personalities, intelligence or athletic prowess. … Here in Merced, a city in the heart of the San Joaquin Valley and one of the country’s hardest hit by home foreclosures, the downturn in the real estate market has presented an unusual housing opportunity for thousands of college students. The revised Home Affordability Refinance Program could apply to a broader base of people. Press Release: 11/11/2011 // (Stockton, Calif.) – The economic outlook for California over the next two years has deteriorated according to the most recent report from the Business Forecasting Center at the University of the Pacific. Real Gross State Product is forecast to grow 1.5% in 2012 and 2.2% in 2013 before picking up to a 3.5% to 4% pace in 2014 and 2015 after housing begins to significantly contribute to growth. Job growth will remain at a 1% to 1.5% annual pace through 2013, enough to keep pace with the labor force but to slow to bring the California unemployment rate below 10% until the end of 2014…. By Bob Howard // Urban Housing Communities LLC of Santa Ana, CA has unveiled its Crossings at Big Bear Lake, a $17 million, 42-unit affordable housing complex designed for families earning between 30% and 60% of the area median income. The project was developed in collaboration with the City of Big Bear Lake’s Improvement Agency, Bank of America, and the project's designer, KTGY Group Inc. Architecture + Planning. Driven again by a “substantial increase” in the multifamily sector, California housing starts rose 10 percent in September when compared to the same month a year ago, the California Building Industry Association says Monday. By Maggie Avants // A foreclosed apartment complex being eyed for financing by a nonprofit agency would offer low-income rents, making a small dent in the city's state-mandated low-income housing quota. Foundation for Affordable Housing, an Orange County-based nonprofit, plans to purchase Rancho Las Brisas Apartments. In addition to setting aside low-income units, the foundation plans to implement a crime-free policy. By Mike Perrault // Since January, 8,399 valley homes and condos have sold, nearly 5 percent more than in the first nine months of 2010, DataQuick reported. The valley is on track to see more than 10,000 home sales this year. By Keeley Webster // Afraid of jeopardizing its tax-exempt bond status, the California Housing Finance Agency has been foreclosing on homeowners who are renting out homes financed by the agency — even if they are current on their mortgages, according to a report by the state Senate Office of Oversight and Outcomes. The San Diego Associated Press reported that Banks sent nearly 26 percent more default notices to California homeowners in the third quarter compared with the previous three months, stepping up actions against those with delinquent loans in what may herald a new wave of foreclosures, a real estate information service reported Tuesday. By Gregg Zoroya // As wars in Iraq and Afghanistan wind down, federal officials are seeing a growing number of young veterans on the street, according to a joint homeless study by the Department of Housing and Urban Development and Department of Veterans Affairs released Friday. By Katy Sweeny // Creating affordable housing paid off for the city Monday — or at least for BMX riders. The state has awarded $245,725 to Chico. The city plans to use the funds to improve the BMX track accessed off Dr. Martin Luther King Jr. Parkway, said Jaki Walker, Chico neighborhood services manager. "Ordinarily, we wouldn't be able to find money for park improvements," Walker said. The California Department of Housing and Community Development gave Chico a grant based on the number of low-income housing units the city created last year, Walker said. Chico built 105 units. By David Benda // Design work for street improvements near Volonte Park in Anderson are among the north state projects that received more than $650,000 in federal funds. The $3 million distributed by the state Department of Housing and Community Development are for economic development and went to 38 cities and counties in California. The awards were announced last week. By Jennifer Medina and Sabrina Tavernise // The continuing economic downturn has drastically altered the internal migration habits of Americans, turning the flood of migrants into the Sun Belt and out of states like New York, Massachusetts and California into a relative trickle, an analysis of recent federal data confirms. The entire rest of the world has been abandoning global warming and climate change policies. If there was any doubt about the economic success of state mandated green programs, it was erased this week after a Senate hearing about the future of alternate fuels. By the end of the four hour hearing, it was clear that climate-change special interests are thriving in California. Fed's Beige Book: Pace of economic growth "modest" or "slight""
The high frequency data and surveys continue to indicate some improvement. Earlier this morning, the 4-week average of initial weekly unemployment claims fell to the lowest level since April - although still elevated - and now the Philly Fed manufacturing survey indicated expansion for the first time in three months - although still weak. Even if there has been a little rebound from the economic shock in early August, due to the threat of a U.S. default, the rebound is just to sluggish growth. And there are significant downside risks from the European crisis and premature tightening in the U.S.
As a reminder, my most used post title over the last few years has been "Jobs, jobs, jobs", and even if we see sluggish growth, jobs remain priority #1 in the U.S. The survey’s broadest measure of manufacturing conditions, the diffusion index of current activity, increased from ‐17.5 in September to 8.7, the first positive reading in three months. The current new orders index paralleled the rise in the general activity index, increasing 19 points and returning to positive territory. The shipments index also recorded a positive reading, increasing from ‐22.8 in September to 13.6 this month. The current employment index remained slightly positive but decreased 4 points from its reading in September. The average workweek index increased notably from ‐13.7 to 3.1. This indicates expansion in October, and was well above the consensus forecast of -9.0. 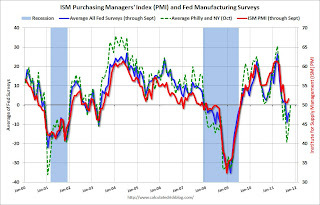 Here is a graph comparing the regional Fed surveys and the ISM manufacturing index. The dashed green line is an average of the NY Fed (Empire State) and Philly Fed surveys through October. The ISM and total Fed surveys are through September. The average of the Empire State and Philly Fed surveys rebounded in October, and is now slightly positive. 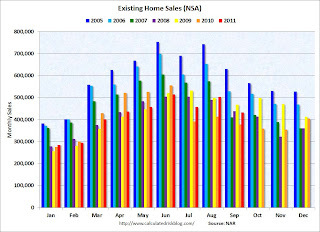 • The following graph shows existing home sales Not Seasonally Adjusted (NSA). The red columns are for 2011. Sales NSA are above last August - of course sales declined sharply last year following the expiration of the tax credit in June 2010 - but sales are also above August 2008 and 2009 (pre-revision). All-cash sales accounted for 30 percent of purchase activity in September, up from 29 percent in August and 29 percent also in September 2010; investors make up the bulk of cash purchases. Total existing-home sales, which are completed transactions that include single-family, townhomes, condominiums and co-ops, declined 3.0 percent to a seasonally adjusted annual rate of 4.91 million in September from an upwardly revised 5.06 million in August, but are 11.3 percent above the 4.41 million unit pace in September 2010. Total housing inventory at the end of September declined 2.0 percent to 3.48 million existing homes available for sale, which represents an 8.5-month supply at the current sales pace, compared with an 8.4-month supply in August. 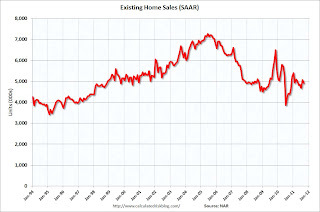 Sales in September 2011 (4.91 million SAAR) were 3.0% lower than last month, and were 11.3% above the September 2010 rate. According to the NAR, inventory decreased to 3.48 million in September from 3.55 million in August. The last graph shows the year-over-year (YoY) change in reported existing home inventory and months-of-supply. Since inventory is not seasonally adjusted, so it really helps to look at the YoY change. Note: Months-of-supply is based on the seasonally adjusted sales and not seasonally adjusted inventory. 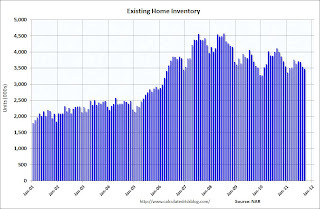 Inventory decreased 13.0% year-over-year in September from September 2010. 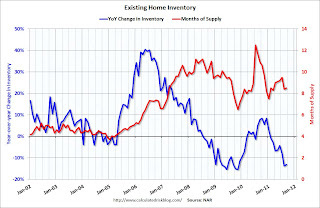 This is the eight consecutive month with a YoY decrease in inventory. Months of supply increased to 8.5 months in September, up from 8.4 months in August. This is much higher than normal. These sales numbers were close to the consensus. In the week ending October 15, the advance figure for seasonally adjusted initial claims was 403,000, a decrease of 6,000 from the previous week's revised figure of 409,000. The 4-week moving average was 403,000, a decrease of 6,250 from the previous week's revised average of 409,250. 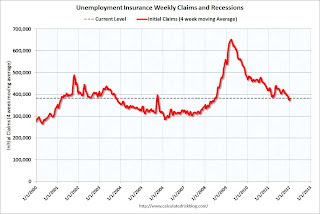 The following graph shows the 4-week moving average of weekly claims since January 2000 (there is a longer term graph in graph gallery). The dashed line on the graph is the current 4-week average. The four-week average of weekly unemployment claims declined this week to 403,000. 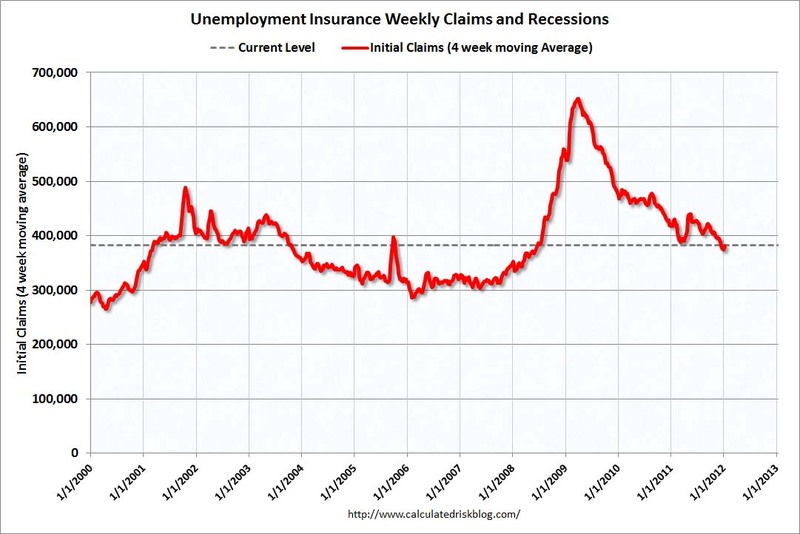 This is the lowest level for the 4-week average of weekly claims since April, and this was slightly above the consensus forecast. This is still elevated, and still above the post-recession lows of earlier this year. France’s president Nicolas Sarkozy flew to Frankfurt on Wednesday night for an emergency meeting with leading players in the eurozone crisis including German chancellor Angela Merkel, as Franco-German differences bedevilled attempts to agree a comprehensive package of measures. European officials are discussing a scenario in which governments issuing bonds would borrow from the bailout fund to guarantee a portion of the bond issues—a move that would increase debts for already troubled economies. Pressure is rising ahead of a weekend summit of European leaders billed as critical to stemming the region's deepening debt crisis. And from the Financial Times: EU bank recap could be only €80bn. The IMF was calling for a €200bn plan, and some estimates were for €275bn. Maybe they should do another stress test and announce all the banks passed - that has worked well before - Not! Although containers tell us nothing about value, container traffic does give us an idea of the volume of goods being exported and imported - and possible hints about the trade report for August. 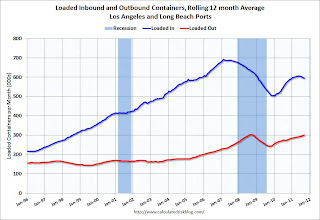 LA area ports handle about 40% of the nation's container port traffic. On a rolling 12 month basis, inbound traffic is down 0.3% from August, and outbound traffic is up 0.9%. [T]he [import] statistics were skewed because of high-than-normal numbers in 2010 when fears of shortages in shipping capacity caused many retailers to bring holiday merchandise into the country earlier than usual. “After a summer of trying to compare apples to oranges, retail cargo is back to normal [in October],” NRF Vice President for Supply Chain and Customs Policy Jonathan Gold said. “October is the historic peak of the shipping cycle each year, and retailers are bringing merchandise into the country on their usual schedule and at normal levels again instead of being forced to move cargo early." 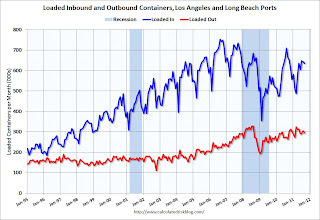 For the month of September, loaded inbound traffic was down 4% compared to September 2010, and loaded outbound traffic was up 12% compared to September 2010. Exports have been increasing, although bouncing around month-to-month. Exports are up from last year, but are still below the peak in 2008. Imports have been soft - this is the 4th month in a row with a year-over-year decline in imports. However, if the NRF is correct, imports will pick up in October to the highest level this year. A new song from blog favorite Merle Hazard about banking regulation. A creative joint venture of Merle Hazard & Marcy Shaffer (see Marcy's site for lyrics). Song by Merle Hazard, Marcy Shaffer and Curtis Threadneedle. And from Paul Solman at the PBS NewsHour site, including a link to his 12 1/2 minute interview with former IMF chief economist Simon Johnson, discussing the song. Reports from the twelve Federal Reserve Districts indicate that overall economic activity continued to expand in September, although many Districts described the pace of growth as "modest" or "slight" and contacts generally noted weaker or less certain outlooks for business conditions. The reports suggest that consumer spending was up slightly in most Districts, with auto sales and tourism leading the way in several of them. Business spending increased somewhat, particularly for construction and mining equipment and auto dealer inventories, but many Districts noted restraint in hiring and capital spending plans. Consumer spending was up slightly in September. The majority of Districts reported increases in auto sales, with the largest improvements in San Francisco and New York. Respondents indicated that labor market conditions were little changed, on balance, in September. ... Most Districts reported that wage pressures remained subdued. All twelve Districts reported that real estate and construction activity was little changed on balance from the prior report. Residential construction remained at low levels, particularly for single-family homes. That said, Philadelphia, Cleveland, and Minneapolis noted small increases in single-family construction, and construction of multifamily dwellings continued to increase at a moderate pace in Boston, Philadelphia, Cleveland, Kansas City, Dallas, and San Francisco. Home sales remained weak overall, and home prices were reported to be either flat or declining across all of the Districts. In contrast, rental demand continued to rise in a number of Districts. Commercial real estate conditions remained weak overall, although commercial construction increased at a slow pace in most Districts. The Consumer Price Index for All Urban Consumers (CPI-U) increased 0.3 percent in September on a seasonally adjusted basis ... The index for all items less food and energy increased 0.1 percent in September, its smallest increase since March. According to the Federal Reserve Bank of Cleveland, the median Consumer Price Index rose 0.2% (2.3% annualized rate) in September. The 16% trimmed-mean Consumer Price Index increased 0.2% (2.5% annualized rate) during the month. 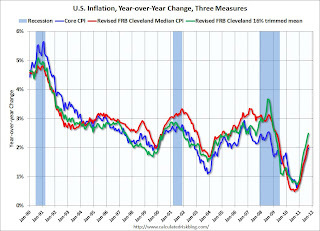 Note: The Cleveland Fed has a discussion of a number of measures of inflation: Measuring Inflation. You can see the median CPI details for September here. On a year-over-year basis, these measures of inflation are increasing, and are around the Fed's target. On a monthly basis, the median Consumer Price Index increased 2.3% at an annualized rate, the 16% trimmed-mean Consumer Price Index increased 2.5% annualized in July, and core CPI increased 0.7% annualized. These key price measures increased at a lower rate than in August. Q. Who should I contact if I have questions about the Uniform Mortgage Data ProgramSM (UMDPSM) and its components? A: We would recommend first visiting eFannieMae.com to view resources posted on our UMDP and related pages. You can also contact your Fannie Mae representative for assistance. But don't wait. If you have challenges with understanding and implementing these requirements, the sooner you reach out for help the better. Fannie Mae successfully implemented the Desktop Underwriter® (DU®) for government loans September 2011 release. This release included a new field for the FHA TOTAL Mortgage Scorecard, FHA loan limit changes and message updates, and updates for HUD Mortgagee Letter 2011-11. Fannie Mae's National Underwriting Center (NUC) is introducing a new business-to-business (B2B) file transfer solution. Users will be able to transfer documents to NUC electronically, helping to reduce paper handling and shortening the time required to fulfill requests. B2B provides secure file transmission and delivery, and enables bulk transfers of files. Select lenders will begin onboarding around September 26, 2011. For details, review the Quality Assurance System page and access the B2B Reference Materials. Jane Youngbuyer has applied for a mortgage loan. You must underwrite the loan manually. How can you determine the overall risk of this loan and determine if it is eligible for sale to Fannie Mae? What's the answer? Americans are growing more pessimistic about the economy, home prices, and household finances, according to Fannie Mae's August National Housing Survey. Information from the August 2011 survey can help focus our collective efforts on stabilizing the housing market. Using the Uniform Appraisal Dataset is a self-paced tutorial that reviews how to apply the new UAD requirements and guidelines when completing appraisal data files. Underwriters can use the information in the tutorial to interpret appraisal data files completed using the UAD standards. We have now added a Certificate of Completion to the tutorial, which participants can print out after completing the tutorial and its accompanying course evaluation. The High-Cost Area (HCA) loan limits for high-balance mortgage loans (HBLs) will change for loans originated after September 30, 2011. Barring congressional action, the "temporary" loan limits now in place will expire on that date, and loans with mortgage note dates on or after October 1, 2011, will be subject to the "permanent" limits. WASHINGTON, DC — Fannie Mae's new monthly national consumer attitudinal survey report provides eleven indicators offering a window into the opinions of Americans across the country. These behavioral insights convey what consumers think about the outlook for owning and renting a home and about their household finances, and may serve as key inputs for determining the future course of investment across housing types. The most detailed attitudinal survey of its kind, the Fannie Mae National Housing Survey polls 1,000 Americans each month via live telephone interview to assess their attitudes toward owning and renting a home, mortgage rates, homeownership distress, household finances, and overall consumer confidence. Homeowners and renters are asked more than 100 questions used to track attitudinal shifts (findings are compared to the same survey conducted monthly beginning June 2010). Fannie Mae conducts this survey and shares monthly and quarterly results so that we may help industry partners and market participants target our collective efforts to stabilize the housing market in the near-term, and provide support in the future. "Our survey data on key aspects of the housing environment and Americans' household financial situations offer a comprehensive view of the marketplace that hasn't existed previously," said Doug Duncan, Vice President and Chief Economist of Fannie Mae. "There's been strong interest across the industry for a monthly consumer attitudinal data set of this size. The data have only a very short lag from collection to delivery and at present show how sensitive consumers are to contemporaneous events. We see a continued lack of confidence among consumers on home prices, the ability to sell their homes, and the state of their personal finances — all of which point to housing as a continued downside risk to economic growth going forward." For detailed findings from the June 2011 survey, as well as technical notes on survey methodology and the questions asked of respondents associated with each monthly indicator, please visit the Fannie Mae Monthly National Housing Survey site at http://www.fanniemae.com/media/survey/monthly.jhtml. Also available on the site are quarterly survey results, which provide a detailed assessment of combined data results from three monthly studies. The June 2011 Fannie Mae National Housing Survey was conducted between June 1, 2011 and June 28, 2011. Interviews were conducted by Penn Schoen Berland, in coordination with Fannie Mae. Forthcoming Fannie Mae National Housing Survey Monthly Reports will be released on or around the seventh day of every month. Ohio Attorney General Richard Cordray and the Ohio Department of Commerce have filed a lawsuit against Santa Ana, Calif.-based Carrington Mortgage Services LLC alleging that the company breached its agreement with the state to offer reasonable loan modifications to eligible borrowers. The lawsuit also alleges that Carrington violated Ohio's Consumer Sales Practices Act by providing incompetent, inadequate and inefficient customer service in connection with its servicing of Ohio mortgage loans. Cordray is the first attorney general in the nation to file suit against a mortgage servicer in the wake of the foreclosure crisis. "This lawsuit makes it clear that we have reached zero tolerance for this kind of behavior from loan servicers," says Cordray. "We've tried to work with them, but now we must take action. I am determined to see that mortgage servicers step up, take responsibility and start making it right with Ohioans. No more excuses." Washington, D.C.--National vacancy rates for rental housing in the second quarter 2009 were 10.6 percent, a 0.4 percent gain from the previous quarter, according to the latest report by the Department of Commerce’s Census Bureau. The Census Bureau found that the rental vacancy rate was higher than the second quarter 2008 rate (10 percent) and higher than the rate last quarter (10.1 percent). Washington, D.C.—Fannie Mae announced that it has provided $10.1 billion in debt financing for the multifamily rental housing market in the first half of 2009.
projects as national models of affordable housing. men and women experiencing homelessness. fountain; and sunny, shaded, planted areas. Attorneys who represent customers of mortgage-modification companies are at risk of losing their law licenses if they split fees with the financiers, two New Jersey Supreme Court committees say. In a joint opinion, the committees state that accepting legal fees from such a company, or dividing with the company a fee paid by a homeowner, constitutes impermissible fee-sharing, and an attorney who engages in such a practice "imperils his or her license to practice law." A new law passed by Congress and signed last week by President Obama provides protections for tenants whose landlords fall into foreclosure. Under the Helping Families Save Their Homes Act, tenants have the right to stay in their homes after foreclosure for 90 days or through the term of their lease. The bill also provides similar protections to housing voucher holders. The protections go into effect immediately and expire at the end of 2012. At least one third of the units going through foreclosure in California are rentals. Under current law, most California tenants are entitled to 60-days notice of eviction after foreclosure. The new federal law increases this to 90 days. In addition, California law provides that leases are extinguished by foreclosure, with limited exceptions. Many tenants enter into one year leases, only to find a few weeks or months later that the property is heading for foreclosure and that their leases will be extinguished. The new federal law provides that the lease survives the foreclosure, except that the lease can be prematurely terminated and the tenant given 90-day notice where a purchaser seeks to occupy the premises. Some California cities have local laws prohibiting foreclosure evictions. The new federal protections do not preempt these laws which remain in full force.